The anniversary of the Montreal Massacre at l’Ecole Polytechnique de Montreal is a milestone in Canadian history. This act of gender-based violence connects the unbroken thread of human rights violations against women in our society. Women in Canada, including Indigenous women, have the right to be free from violence. OECTA seeks to enhance the status of women in society nationally and internationally. It is therefore imperative that this annual anniversary not only be recognized and honoured, but that resources are available to provide a foundation for action and change through education. As teachers, self-reflection and critical awareness of increasingly diverse and multiple points of view in a changing world are a necessary part of this circle of transformation. We all seek the change that unravels the source of gender violence so that in remembrance of the 1989 Montreal Massacre we can confidently hold ‘never again’ in our hearts But gender inequity is raised not only in acts of physical violence but also in missed opportunity in education. The influence of gender on “ the access to linguistic and interactional resources, on the dynamics of the classroom and on language learning outcomes” has been an on-going debate in scholarly research. This commemorative resource provides ideas and classroom resources for teachers to help them examine the crucial role of gender equity, marginalized women, gender violence and further challenges. A critical approach to controversial topics through problem-solving, scenarios and discussions potentially “raises alternative discourses of gender and sexuality and enhances (students’) ability to reflect critically, to interpret verbal and nonverbal behaviours in context, and to perform gender in context-appropriate ways.”. Commemorating the Montreal Massacre is also a reflection of hope and change. The tragic loss of these young women motivates us to actively seek fundamental societal and cultural change so that not only our Canadian daughters, but daughters everywhere can share in the promise of their futures. 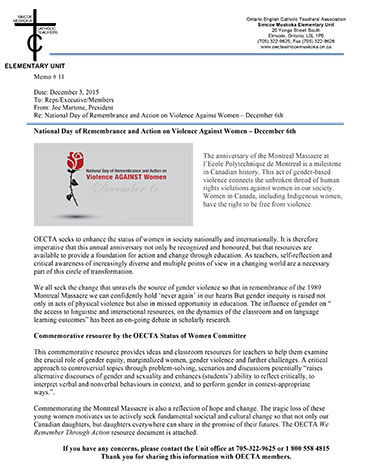 The OECTA We Remember Through Action resource document is attached. Thank you for sharing this information with OECTA members.